Our Pin Oak Resort Pigeon Forge nightly cabin rentals are situated just across from the Hatfield and McCoy Dinner Theater, Wonderworks, the Titanic Museum and our very own Cabins USA office just as you enter the city of Pigeon Forge. Looking for a nightly cabin rental in Pigeon Forge next to some of the areas biggest Smoky Mountain Attractions, our Pin Oak Resort cabin rentals are one of the best choices for comfort and closeness to all the fun. Enjoy nightly cabin rentals in Pigeon Forge TN offering a resort atmosphere with swimming pool access in the warmer months. Take a relaxing dip in the pool or spend time playing water games with family and friends between planned Pigeon Forge Events. 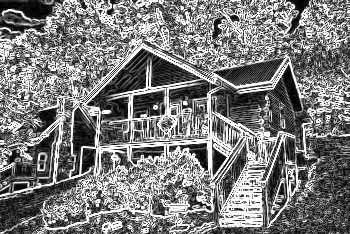 Our Pin Oak Resort cabin rentals are spacious 1 and 2 bedroom cabins, many with individual amenities including hot tubs and game tables. SAVE when you BOOK your Pin Oak Resort nightly cabin rental ONLINE with Cabins USA! Looking forward to your Smoky Mountains vacation with us at Cabins USA in Pigeon Forge Tennessee.